JIFFY FEET – Southern Fried Awesome! Urban Camping at Starbucks! Wi-Fi? Wi-Not! 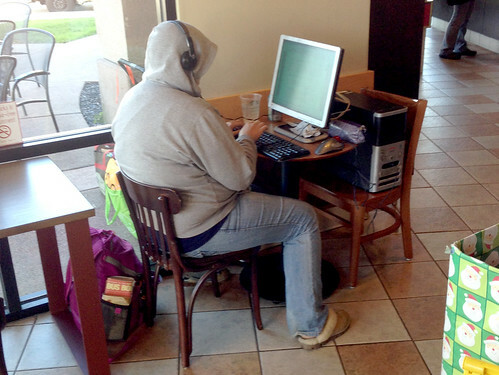 Urban Camping at Starbucks! Wi-Fi? Wi-Not!, originally uploaded by jiffyfeet. This is Major Tom to Ground Control, Im in slippers in a Starbucks! 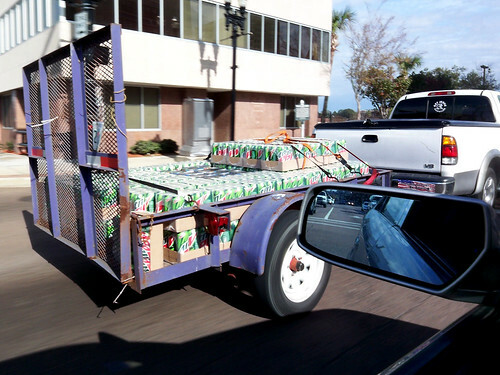 How Much Dew Can You Do? How Much Dew Can You Do?, originally uploaded by jiffyfeet. Uhh Gimme That Mountain Dew I Ain’t Playin Which You, Gimme My Mountain Dew! This might be the most EXTREME post we have ever had! I mean seriously, how much Mountain Dew can one consume? haha. And to top it off they are TALL CANS! If you have never heard of MOUNTAIN DEW MOUTH just search it on the interweb but make sure your not about to eat anything, haha. Oh there is also a rap song. Listen Here – www.youtube.com/watch?v=4HvWTv9TM-c Photo: Bruce Bruce! DODGE NEON – THE BABY DEER KILLER! 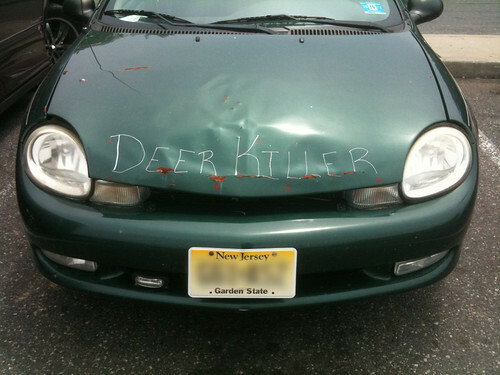 DODGE NEON – THE JERSEY BABY DEER KILLER!, originally uploaded by jiffyfeet. They See Me Hoardin’… They Hatin’…, originally uploaded by jiffyfeet. Part Time Wife / Full Time Mom Needed! Part Time Wife / Full Time Mom Needed!, originally uploaded by jiffyfeet. 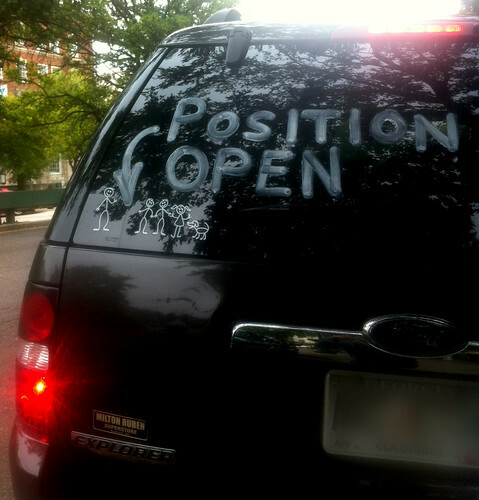 I don’t know about yall, but this is the funniest thing I’ve seen since these stickers have come into existence. If I had to guess, i would say things didn’t end so well or Daddy just has a real sense of humor… Or both. 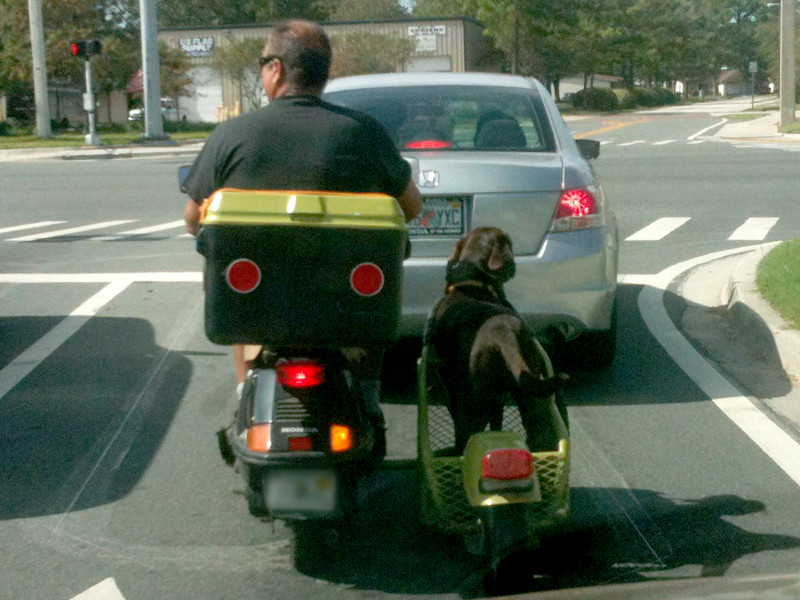 Props to Dan from W/S for catching this pic in Augusta GA! Toyota TurtleCel – Piano Trucker Edition! 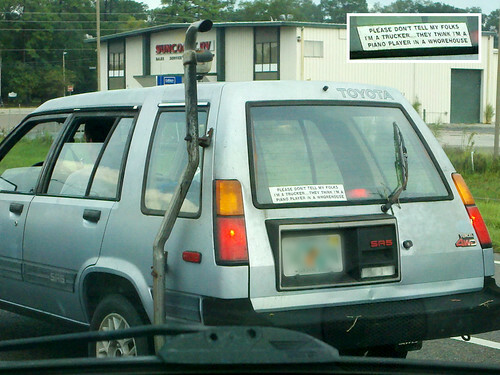 Toyota TurtleCel – Piano Trucker Edition!, originally uploaded by jiffyfeet. 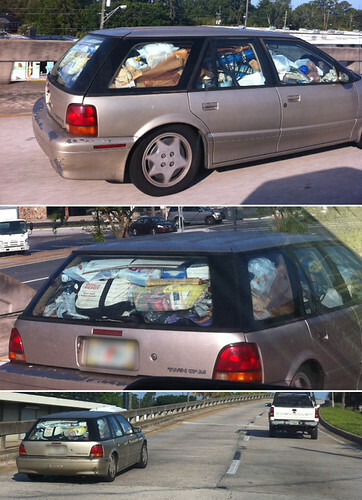 So when Meredith sent this pick in fresh from Beach Blvd traffic last week, I thought wow thats a 4×4 Toyota Tercel… I guess it’s fitting that it has 4×4 because it looks and moves like a freaking turtle! Then I noticed the crazy Snorkel Exhaust welded onto the drivers side and though man, i guess this thing really does do some serious off roaring! Not to mention there are sticks stuck all over it. Then the real magic of this pic caught my eye! That lonely sticker in the back window reads "PLEASE DON’T TELL MY FOLKS I’M A TRUCKER… THEY THINK I’M A PIANO PLAYER IN A WHOREHOUSE"!!! Wow. Where do you even get a bumper sticker like that? Probably in a Whorehouse I guess. Triple Points on this pic for you Meredith, The Goodies in this pic just keep on going! 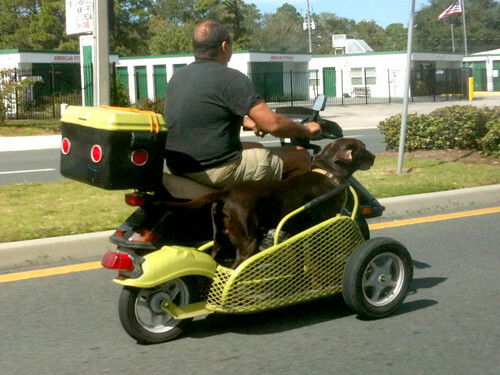 – Photo: Meredith F. Beach Blvd Jacksonville. 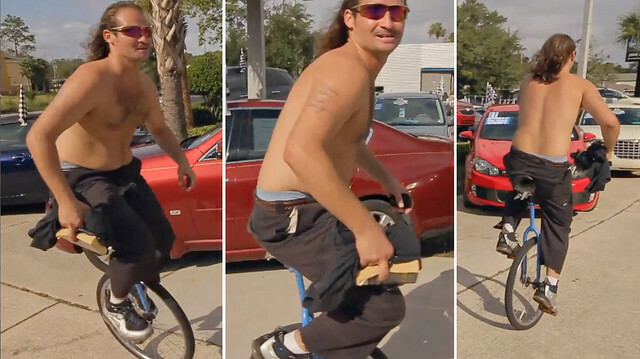 Mayport Mullet On A Unicycle! 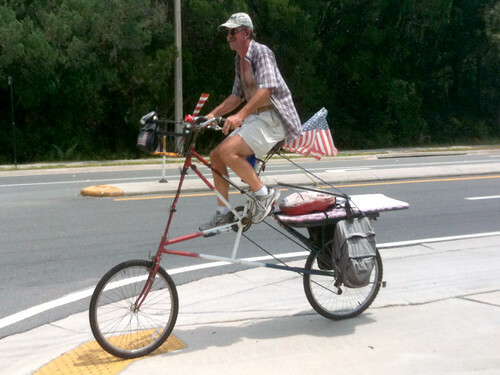 The “Mad Tex” Mobile… Rust Or Bust! 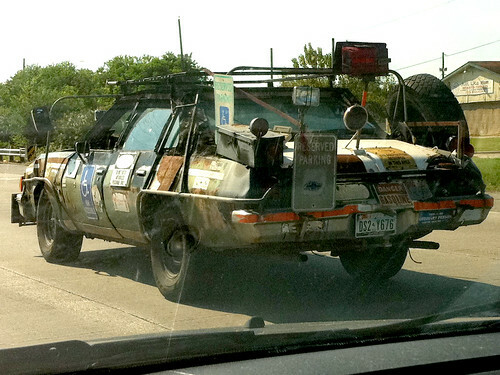 Mad "Tex Max" Mobile… Rust Or Bust!, originally uploaded by jiffyfeet. Allison, a Jacksonville native transplanted in Houston, TX. saw this on her way home from work where I45 joins the 610 loop last week. She said “I couldn’t get close-ups a la cousin Duddy. Mostly because I am horrible at multi-tasking while driving. In the interest of public safety I decided to sacrifice picture quality. I think what makes it is the exoskeleton-like roll cage and the spare tire which looks like it was meant for a lifted truck. Also, I was expecting the driver to be young and hippie dippy but he was actually a grandpa in a fisherman’s hat much in the vain of Grumpy Old Men.” Way to go Allison, this rusted “Hunk-O-Fun” has all the “Right Signs” to be featured on Jiffy Feet.